Your child receives a very special invitation from Santa to visit the North Pole! A perfect keepsake for your child to treasure! 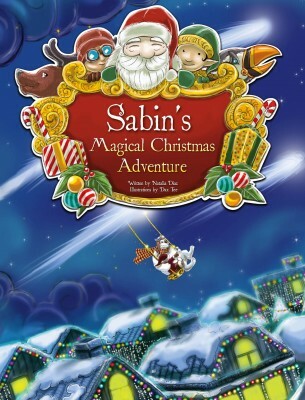 My Magical Christmas Adventure is a beautifully illustrated book that takes your child on an exciting trip to the North Pole after receiving a once in a lifetime invitation from Santa to visit his workshop! This 24page professionally bound storybook is personalized throughout the text and illustrations, which include the child's name, home country, relatives and/or friends, making it a unique, personalized keepsake for your child. As an added personal touch, this book contains a printed dedication from the sender. Written by internationally published writer Maria Natalia Mercedes Diaz and illustrated by Dax Xenos Tee, each 8 3/8” x 10 3/4” hardcover book is especially made for your child and includes illustrated fun facts about the North Pole. It is a perfect Christmas gift for both boys and girls ages 0-10. When ordering, customers have the option to upload a photo of the child, to appear on the dedication page of the book.